EU Referendum: Pachauri: How much is this man getting? 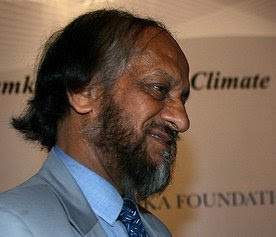 Pachauri: How much is this man getting? First, as we reported yesterday, we have the £30,417 donated by DEFRA, paid to TERI Europe via Cambridge University to cover Pachauri's salary and travel in producing a Synthesis Report of the IPCC AR4. Then, gleaned from the IRS return submitted by TERI-NA (North America) for the financial year ending in 2009, we get the information that a $27,000 donation was made by the Germehausen Foundation, "to support outreach efforts on the fourth assessment report of the IPCC." The cash was remitted to TERI India, its obvious intended recipient being R K Pachauri. Now we have the European Climate Foundation which, in the grant year 2009, makes a donation of an unspecified amount, direct to TERI India. This is to "facilitate meetings between Dr R K Pachauri and key European decision makers in support of an international agreement on climate change." This one should be of special interest to James Delingpole who reveals in his latest piece that he has a family friend who works for the Foundation. Perhaps he can ask him next time they meet how much cash went Dr Pachauri's way. What we are seeing here though is an interesting modus vivendi - three different payments to support the chairman of the IPCC, yet each payment is made by a different organisation to a different organisation – one in the US, one in the UK and one in India. No one knows what the other is doing - except Pachauri, of course. On top of that, of course, multi-millionaire businessman Pachauri has a separate funding stream from the IPCC, which pays his salary and – crucially – his travel expenses. Already, we have seen him claim from the IPCC for journeys to London and Delhi which were clearly private business. This scam, it seems, was also played out in China when the good doctor claims a trip from Aomori in Japan to Peking on 23 April 2007, to attend a Low-carbon Economy Seminar of the China Council for International Cooperation on Environment and Development, then flying off to Bangkok on 29 April. On the participants' list, he is indentified as the "Director General, TATA Energy Research Institute, India" (someone has not told the Chinese about the name change) and it is clear from a subsequent event that Pachauri is doing business on behalf of TERI with the Chinese. Pachauri is in fact a member of the China Council and one wonders which – or how many – people paid his expenses for the meetings. It takes until 2008 before he is described as Director General, the Energy & Resources Institute, India and Chair of UN Intergovernmental Panel on Climate Change (IPCC), which presumably then allows him to claim legally from the IPCC. With so many paymasters though, and such a multiplicity of payment routes, Pachauri's financial affairs should be raising these sort of alarm signals. This man, however, seems to be above the law.